Happy Birthday to me! It’s my 22nd birthday and I am ready to celebrate! So much has happened in the past year – I moved to Nashville to do an internship, I finished one of the hardest semesters of my college career, oh and I got engaged! Yeah – you read that correctly, Cory and I got engaged a few weeks ago and have been wedding planning ever since! We’re so excited and are so blessed to have all you wonderful people in our lives! You all have been so kind to us! 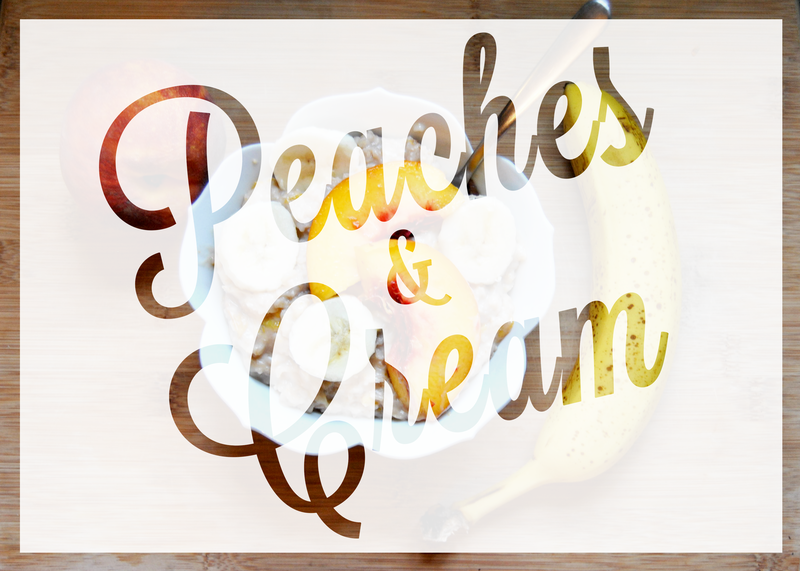 There are lots of things to celebrate as I turn 22, so I started off the morning with a bowl of Peaches and Cream Oatmeal! In a medium pan, bring water to a boil. 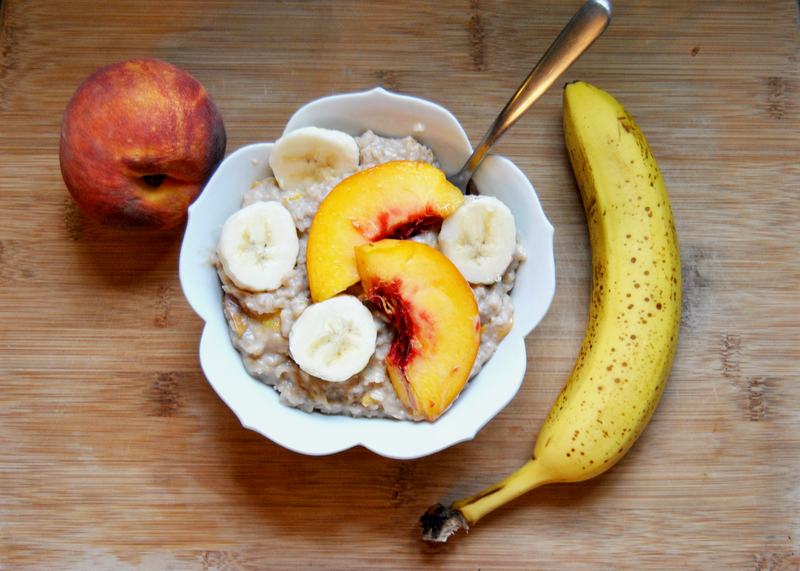 Add 1/2 of your peach, 1/2 of your banana, and your oats to the water and stir. Reduce heat to medium-low and cook for 10 minutes, stirring occasionally, until most of the water has evaporated. Add coconut milk and cook until oatmeal is creamy, about 7 minutes. Top with 1/2 of your peach slices and 1/2 of your banana and serve. How easy is this? 4 simple ingredients, 20 minutes, and you have a hearty, healthy, naturally sweetened breakfast! 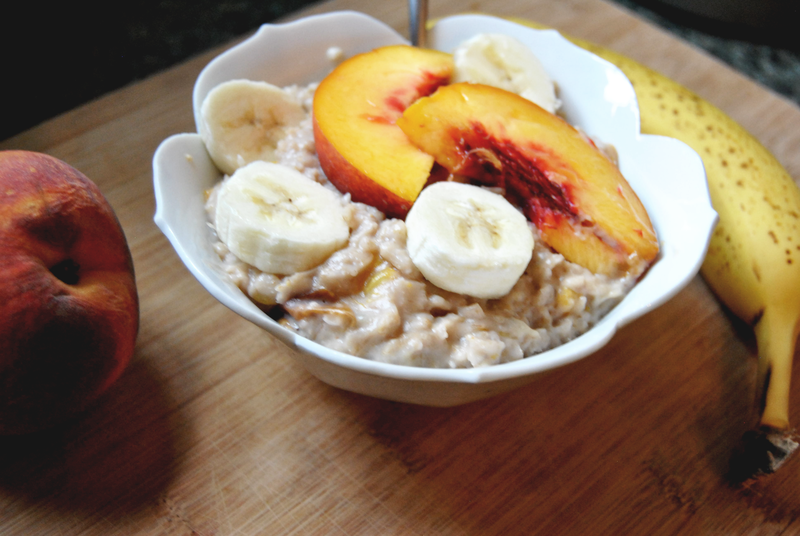 The coconut milk makes the oats nice and creamy, while the bananas and peaches add a fresh, cool flavor to this meal. Add some walnuts or almonds to add a bit of crunch, or a spoonful of almond butter to pack a little more flavor into this simple meal. I was so pleased with this recipe because I got to use peaches from the Georgia Peach truck – a peach truck that parks at the Farmer’s market around this time of year and sells the best, most delicious peaches known to man. Oh dear lord, coconut milk… an absolute weakness of mine! Sounds delish and… congrats on your engagement! I LOVE COCONUT MILK, TOO! 🙂 It’s my favorite of all the fake milks. 🙂 Thank you for the well wishes! Lol @ fake milk (mine too, and lord knows I’ve tried to love almond milk)! Oh shoot, and happy birthday too! 😃Your tasty breakfast looks sooo gooooood! Yummmm! 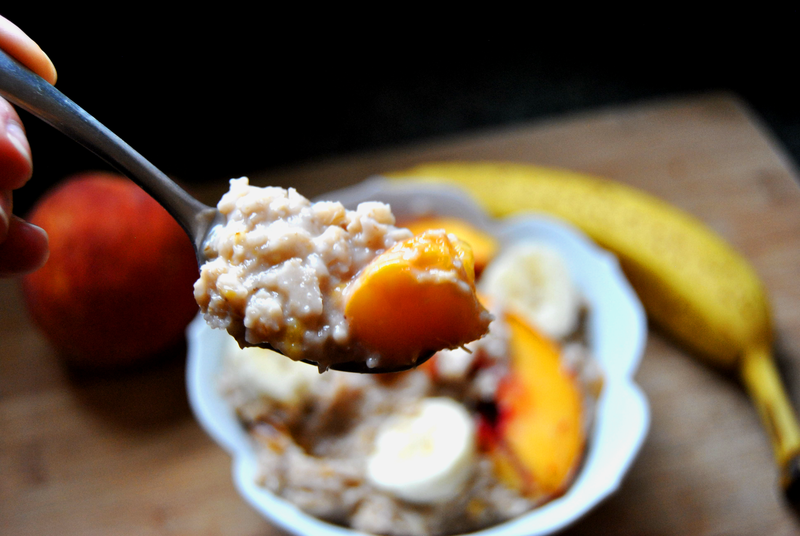 Sometimes, I add freshly cut up peaches in my oatmeal so that they go really soft! Sometimes, I add some vegan chocolate chips! That is brilliant. How have I never thought of putting coconut milk in oatmeal before?! I also just discovered baked oatmeal. It’d be fun to try to convert this to a baked oatmeal recipe! Either way, I’m definitely going to have to try it. Thanks!